Whether it’s raising money to help wounded veterans or generating aid to a hospice facility, the staff and residents at Bear Hill find ways to add meaning to each day through activities that do good for the community—and leave our residents feeling good about themselves, too. The Resident Council at Bear Hill Rehabilitation and Nursing Center in Stoneham, Mass. held a raffle to raise money for The Wounded Warrior Project which benefits American veterans and their families. 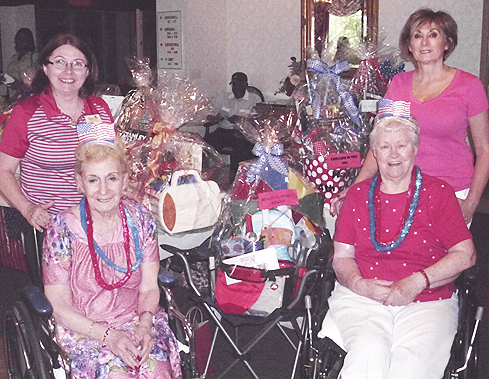 The prizes were a variety of spectacular baskets created by the staff of Bear Hill. Pictured above are (left to right) Bear Hill Activities Director Marie White, Resident Council President Nina Raia, resident Elinor Roden, and Director of Nursing Peg Archidiacono, RN.